Why does God even bother? As a journalist, I have had occasion to spend time with famous people who make me feel very small. I have interviewed two presidents of the United States, members of the rock band U2, Nobel laureates, television stars, and Olympic athletes. Although I prepare my questions thoroughly in advance, I rarely sleep well the night before and have to fight a case of nerves. I hardly think of these people as mutual friends. In prayer I am approaching the Creator of all that is, Someone who makes me feel immeasurably small. How can I do anything but fall silent in such presence? More, how can I believe that whatever I say matters to God? If I step back and look at the big picture, I even wonder why such a magnificent, incomprehensible God would bother with a paltry experiment like planet Earth. A God unbound by our rules of time has the ability to invest in every person on earth. God has, quite literally, all the time in the world for each one of us. 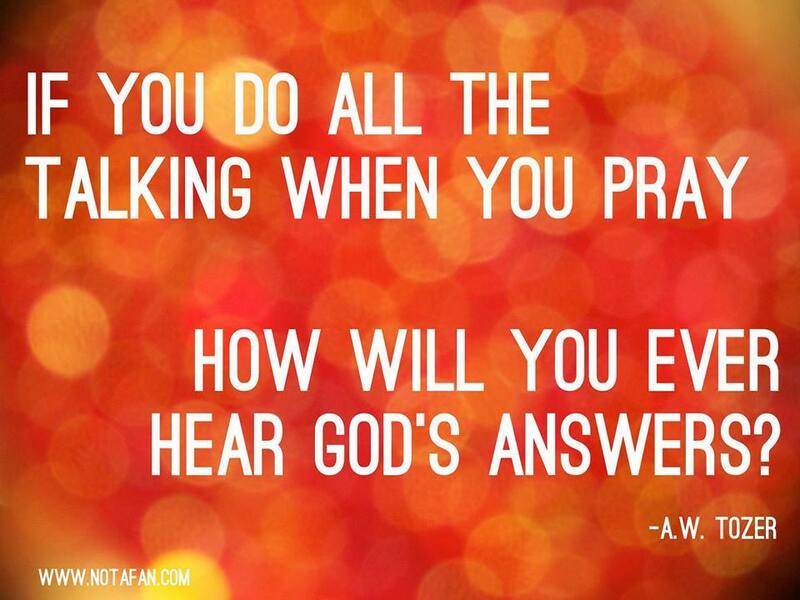 The common question, “How can God listen to millions of prayers at once?” betrays an inability to think outside time. Trapped in time, I cannot conceive of infinity. The distance between God and humanity—a distance that no one can grasp—is, ironically, what allows the intimacy. Jesus, who accepted the constraints of time while living on this planet, understood better than anyone the vast difference between God and human beings. Obviously, he knew of the Father’s greatness and at times reflected nostalgically on the big picture, “the glory I had with you before the world began.” Yet Jesus did not question the personal concern of God who watches over sparrows and counts the hairs on our heads. More to the point, Jesus valued prayer enough to spend many hours at the task. If I had to answer the question “Why pray?” in one sentence, it would be, “Because Jesus did.” He bridged the chasm between God and human beings. While on earth he became vulnerable, as we are vulnerable; rejected, as we are rejected; and tested, as we are tested. In every case his response was prayer. ~ Philip Yancy in Prayer: Does It Make Any Difference? © Richard Alvey and iLife Journey, 2014. All rights reserved. What if God doesn’t want us to do life for Him? Back on Mother’s Day my daughter Mykaela and I were discussing different aspects of a relationship with God when she made a familiar statement. I’ve made that same statement countless times and was delighted to hear her express such a God-honoring sentiment. But this time it triggered a peculiar thought. Doing life for someone typically happens when that person is absent or bed-ridden with illness or even dead. You know, like “Win one for the Gipper.” But since God isn’t absent or sick or dead, maybe there’s an even better option. 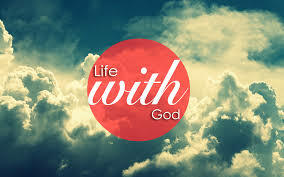 Maybe God would prefer that we do life with Him rather than for Him. I used Mother’s Day as an example and explained that instead of planning the meals and special activities for Susan, I planned them with Susan. I got her input on what she would most enjoy. It’s not a bad thing to take 10 minutes at the start of a day to talk with God and commit to living for Him. But how might our days go differently if we went into them with the awareness of God’s presence; of doing life with Him? But if I approach each day with God then perhaps He’ll give me grace for the unexpected or even use them to redirect me toward a divine encounter I hadn’t planned on. Prayer keeps us connected to God so that we can do life with Him at any given moment. And He delights in doing life with His children! 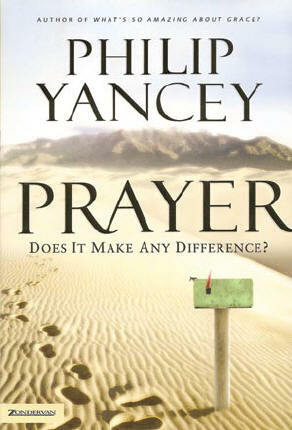 ~ Philip Yancey in Prayer Does It Make Any Difference? 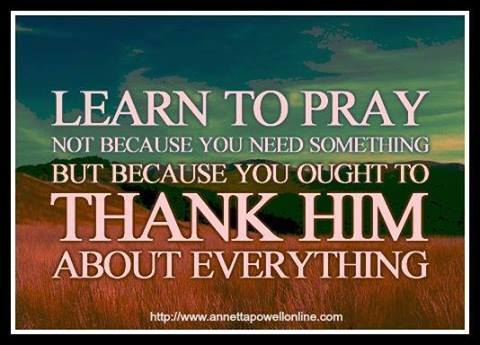 Be thankful in all circumstances, for this is God’s will for you who belong to Christ Jesus. Prayer… adjusting how we view reality. The prophet Daniel defied a tyrant’s orders by opening his window and praying three times a day toward his home city of Jerusalem. For him, for the other believers living in foreign lands… prayer was the main reminder of a reality contradicted by all surroundings. A channel of faith, it served to restore the truth belied by everything around them. For us, too, prayer can be that channel. We live on a broken planet, fallen far from God’s original intent. It takes effort to remember who we are, God’s creation, and faith to imagine what we someday will be, God’s triumph. Prayer has become for me much more than a shopping list of requests to present to God. It has become a realignment of everything. I pray to restore the truth of the universe, to gain a glimpse of the world, and of me, through the eyes of God. In prayer I shift my point of view away from my own selfishness. I climb above timberline and look down at the speck that is myself. I gaze at the stars and recall what role I or any of us play in a universe beyond comprehension. Prayer is the act of seeing reality from God’s point of view. ~ Philip Yancey in Prayer: Does it Make Any Difference? “Be still and know that I am God”: the Latin imperative for “be still” is vacate. As Simon Tugwell explains, “God invites us to take a holiday [vacation], to stop being God for a while, and let him be God.” Too often we think of prayer as a serious chore, something that must be scheduled around other appointments, shoehorned in among other pressing activities. We miss the point, says Tugwell: “God is inviting us to take a break, to play truant. We can stop doing all those important things we have to do in our capacity as God, and leave it to him to be God.” Prayer allows me to admit my failures, weaknesses, and limitations to One who responds to human vulnerability with infinite mercy. ~ Philip Yancey in Prayer: Does It Make Any Difference? A ragamuffin in awe of God's grace and glory... pursuing real life in Jesus. Friday Funny! ;-) Perks to bad breath? Sorry Thor, we love you but you're just a pet! Don't give in to shallow praise! Where did Jesus learn that? © Richard Alvey and iLife Journey, 2010-2012. Unauthorized use and/or duplication of this material without express and written permission from this blog’s author and/or owner is strictly prohibited. Excerpts and links may be used, provided that full and clear credit is given to Richard Alvey and iLife Journey with appropriate and specific direction to the original content. iLife Journey · Pursuing Jesus to embrace real life.